The second participant in the MagMods Essay Club is Lisa Rhody, a Ph.D. candidate in English at the University of Maryland. Her dissertation bridges her interests in digital humanities and Modernism by using network theory to revise existing models of Modernist and postmodern ekphrasis. She edits the Teaching and Learning News and Teaching Resource Guide for the Center for Teaching Excellence at UMD. 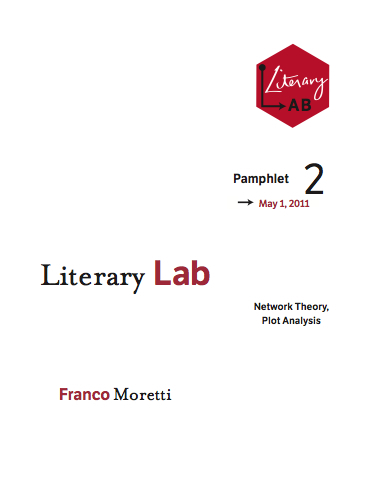 Franco Moretti’s description of his own research and subsequent reactions to Pamphlet 2: Network Theory, Plot Analysis are often framed in the language of time and space. Moretti refers to network analysis as a way of freezing the narrative progress of Hamlet and capturing the play’s plot all at one glance in a visual display of its character network. Popular responses, such as Kathryn Schultz’s in The New York Times, focus on the danger of fixating the living, breathing work of literature into the space of a limited and admittedly insufficient network that cannot fully represent the text. Meanwhile responses by literary scholars shape themselves around the limitations of Moretti’s metaphors: Is the model a skeleton? An x-ray? A map? The language of time and space surrounding Moretti’s work reminds me of the rhetoric of the Sister Arts tradition, in other words, the relationship between poetry and painting that has existed since Horace’s analogy—“as painting, so is poetry.” In his book Iconology (1990), W. J. T. Mitchell recounts the ut pictura poesis tradition as rife with political, moral, and social anxieties. In Western civilization, the seemingly immediate and transparent image repeatedly challenges the authority of language and by association theology, which must fend off the assault of the deceptively accurate image by explaining it away with words. At the nexus of this vexed tradition exists a genre of poetry called ekphrasis, defined as the poetic representation of visual representation. Studies in ekphrasis frequently revolve around the polarities of time (i.e. language) and space (i.e. visual art) as hostile and gendered oppositional forces, one always striving to co-opt and to remediate the other. In light of the historical tensions between the realms of time and space, it is unsurprising that literary scholars might resist Moretti’s assertions when he describes his network visualizations as a celebration of space over time: “Four hours of action, that become this. Time turned into space: a character-system arising out of many character-spaces, to use Alex Woloch’s concepts in The One vs. the Many” (3). And later: “The past becomes the past, yes, but it never disappears from our perception of the plot. Making the past just as visible as the present: that is one major change introduced by the use of networks” (5). Moretti presents the visualization of textual data as the spatial representation of the play’s linear narrative. Moreover, he likens his future models to the “stern adulthood of statistics,” positioning them opposite to the “theology” he describes literary studies to be, thereby reifying all the traditional anxieties about images poised to supplant the truth and authority of the text itself and tapping into a longstanding history of competition between verbal and visual media. The results are rather predictable. Kathryn Schultz responds, “The trouble is that Moretti isn’t studying a science. Literature is an artificial universe, and the written word, unlike the natural world, can’t be counted on to obey a set of laws.” Network analysis, and more significantly visualizations of network analysis, are seen as threatening the creativity, the life, the humanity of what it is meant to represent—not unlike Keats’ charge against the “still unravish’d bride of quietness” we know to be frozen in the pregnant moment of pursuit in the most iconic of all ekphrastic poems, “Ode on a Grecian Urn.” Beautiful and permanent, the maiden will remain cold and lifeless. To some, Moretti’s visualizations threaten to strip literature of its creative breath, of its originality, of what they hold most dear as readers and scholars. For a moment, let’s resist the urge to conceive of time and space and by extension verbal and visual representation as always in competition with one another—even the “Sister Arts” metaphor between poetry and painting implies a kinship as much as a rivalry. In the study of ekphrasis, where competition between the arts had become a model for how the genre operates, we have missed opportunities to see and to understand aesthetic cooperation because we are first trained to see them in contention. In “Ekphrasis and the Other,” Mitchell creates a model for ekphrasis called the “ekphrastic triangle” in which an active speaking subject represents a passive aesthetic Other to his complicit reader (think: Robert Browning’s “My Last Dutchess”), establishing for the genre a socially-inscribed power relationship between the three parties. However, Mitchell’s model (by his own admission) includes examples only by male poets: Keats, Shelley, Williams, Stevens, and Ashbury. On one hand, Mitchell’s “ekphrastic triangle” works well to describe a competitive dynamic between two rival arts, but on the other hand, it fails to provide a way of describing ekphrastic poems that resist such conflict. Recent scholarship—by Willard Spiegelman, Jane Hedley, Elizabeth Loizeaux, Bonnie Costello, and others—has begun to change that by revealing ways that Modernist ekphrasis demonstrates interaesthetic collaboration. In my own scholarship, I have turned to social network analysis to address two questions: 1.) How does the social dynamic of ekphrastic poetry change when poetry by women is included in the canon? 2.) How do we represent a greater diversity of social relationships in ekphrastic poetry? The process involves the same close reading and hand-drawn network visualizations Moretti’s research begins with and similarly builds toward a more distant, computational approach. What does this mean with respect to Moretti’s network analysis? In the first half of the pamphlet, the focus is on building a model to represent plot using characters and speech-acts. Literary scholars often rely on models to represent how texts operate. Consider, for example, Aristotle’s rhetorical triangle or Chatman’s model for narrative or Mitchell’s model for ekphrasis. Models are tools we use to understand and to identify how individual texts do or do not fit into an established pattern. They help us to create definitions, to challenge definitions, and to read anew. Problems arise when we can’t see beyond existing and potentially flawed models, and this is where Moretti’s work is helpful. Rather than close readings, Moretti uses computation to identify textual behavior, which offers the radical change in perspective we sometimes need when we start to mistake the model for the thing itself, as was the case for ekphrasis for many years. Another critique often leveled at Moretti’s work is that it renders obvious answers. Should we be surprised that Hamlet is, in fact, the center of Hamlet’s social network? No. The paper doesn’t argue that we should be surprised; instead, this information acts as a type of control. If Hamlet weren’t the center of the play’s network, we would know something was very wrong with the model. The obvious answers show that the model is working at least at a modest level. Despite his misgivings about the “hand drawn” networks, the Hamlet­-visualizations reveal that social network analysis might represent one aspect of how this plot operates, and they identify centrality based on a narrow definition of relationship: speech acts. When Moretti begins to tinker with the model to see what other questions could be asked and what new knowledge might be generated based on the model’s creation, we trust the model has a certain amount of reliability, which causes Moretti to discover something else: network models encourage play. The model invites its creators to look at the text in a way we couldn’t do before, and by manipulating the model, Moretti discovers that Horatio is more important to the structure of the play’s social connectedness than Claudius. I’m not a Shakespeare scholar, and, perhaps, this isn’t an “ah ha” moment for someone who is; however, by revealing how the model functions at a deeper level of sophistication than simply “Hamlet is central to Hamlet,” the Hamlet-network proves that social network theory offers promising opportunities to scholars who want to model social relationships in texts. Furthermore, these unexpected moments of discovery prompt us to return to the text itself. Much like the artificial divisions of time and space in the ut pictura poesis tradition, close and distant readings need not be at odds with one another. Moretti’s paper demonstrates that social network analysis, even as hand-drawn visualizations based on simple computational analysis (one that doesn’t even make use of the full range of statistical data that computers can discover about the play) can render useful questions. Social network visualizations help us to see genre from a fresh perspective and prompt us to pose questions we never thought to ask. In Moretti’s own words, “we would never think of discussing Hamlet—without Hamlet. But this is exactly what network theory tempts us to do: take the Hamlet-network (Figure 10), and remove Hamlet to see what happens” (5). This is not all that Moretti wants to do. It is only part of the first step in his research goals, but this first step is helpful to those like me who want to use social network analysis to ask new questions about other genres characterized by deeply ingrained assumptions about how they operate. Understanding how we can use data mining and network theory to approach literary texts is still in its naissance, and scholars working in this area are still discovering what questions might be asked and what opportunities could be produced by such an approach. Whether he likes it or not, Moretti demonstrates that close reading is an important part of distant reading. Unlike the anxieties, which Moretti occasionally provokes, about close reading being a relic of the past, distant reading isn’t possible without close reading. Instead, distant reading methodologies encourage us to be honest and explicit about the assumptions and decisions we make in the process of creating models and, consequently, definitions. Computational analysis requires increased accountability. Made clear by an accurate critique of Moretti’s earlier work by Allen Riddell, reliable computational methods must be reproducible. It’s not something we are accustomed to in literary studies, but what if we were? If we were made to account for each of our assumptions, each of our methods, each of our reasons for choosing one scene or one poem or one author over any other, would we, for example, still have a theory of ekphrasis defined by a canon constructed of predominantly male poets? If we get caught up in the anxieties of whether or not an image can fully and accurately represent the complexity of the written word, we miss opportunities to discover questions we haven’t thought to ask. What might an increased awareness of our own methods do to our reading of texts? I see this not as an anxiety-producing exercise but as a liberating one. When we know how and why we make decisions, we know better what the repercussions of those decisions are. The challenge for Moretti and others performing similar research is scale. How do we perform and represent the same analysis over a large corpus of texts and discover something meaningful? For now, though, Moretti’s network visualizations reveal that small-scale modeling will be an important part of how we get there, and they demonstrate one way in which network analysis is a promising approach for representing social interactions in texts, be they Shakespeare’s plays or Modernist ekphrasis. In Moretti’s search for revolutionary change in literary studies, perhaps the most significant advancements are the small, sometimes unintentional but necessary consequences of finding what works. By being brave enough to ask questions differently, we reinvest literary studies with the creative breath that many scholars are nervous computational analysis will take away.